David Mills is the author of two books of poetryThe Dream Detective and The Sudden Country, a book-prize finalist. His most recent manuscript is also a finalist for the Crab Orchard Review Prize. 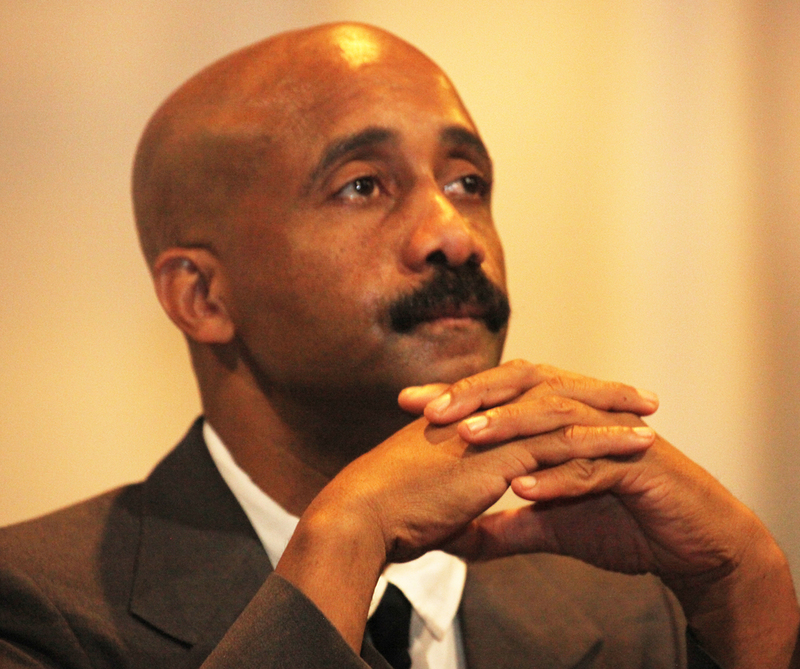 He has received fellowships from the New York Foundation for the Arts, Breadloaf, and the Queens Council on the Arts. He has an MFA from Warren Wilson College. His poems have appeared in Ploughshares, Crab Orchard Review, Fence, Colorado Review, and Vermont Literary Review. He has also recorded his poetry on RCA Records and for ESPN, and had poems displayed at the Venice Biennale. 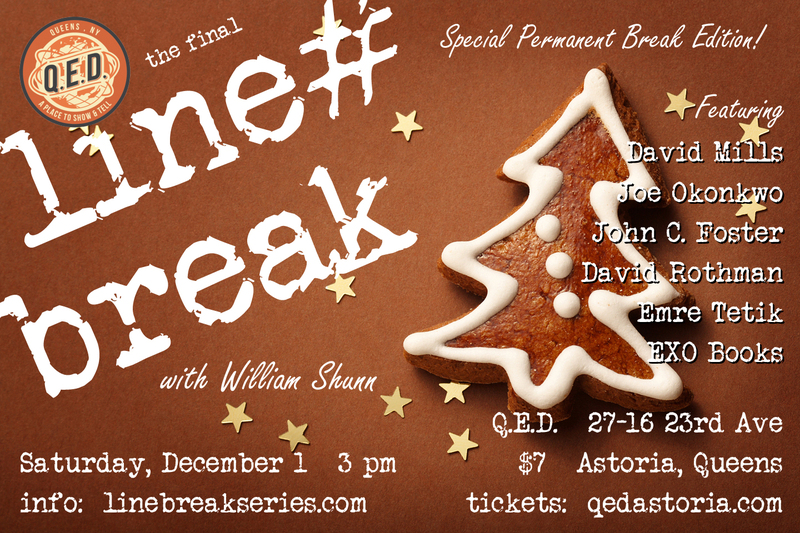 Please join David and all our world-class readers for Line Break #25, Saturday, December 1, 3:00 p.m. at Q.E.D. in Astoria. Tickets are only 7 bucks! Line Break is here again! 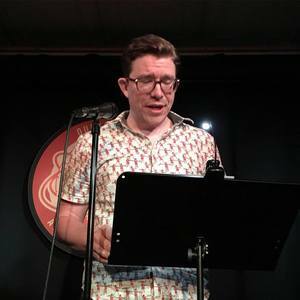 It's the eclectic monthly live literary magazine where poetry meets prose, fact meets fiction, and high-brow meets low-brow, this time in a special Permanent Break Edition in Astoria, Queens. * John C. Foster will be unable to appear due to unforeseen circumstances. Saturday, December 1, 2018, 3:00-4:30 p.m. Thanks for making Line Break #24 so compelling! A gigantic thanks to everyone who turned out for the twenty-fourth regular episode of Line Break this past Saturday, at beautiful Q.E.D. in Astoria, Queens. You were a tiny crowd, perhaps due to the date change and the New York Marathon, but just by showing up and giving us the gift of your attention, you helped make the afternoon bigger and better than it would have been without you. Thanks as always to Q.E.D. for giving us the space and an opportunity to use it. And thanks especially to our amazing readers, who made it the fantastic show it turned out to be. 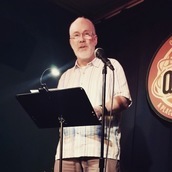 Host and editor William Shunn kicked things off with "Stand Up," a tale of dark doings in a futuristic comedy club. 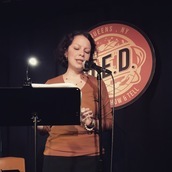 Last-minute sub Stephanie Laterza shared poetry from her upcoming chapbook The Psyche Trials. Host Susana H. Case provided a visual feast with a presentation of poems from her new book, Erasure, Syria. 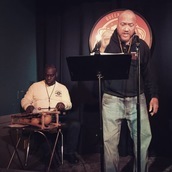 Oscar Sanders performed spoken-word selections from his play Diplomacy, with Naqaash Dorrell on percussion and harmonica. And finally, the legendary Eleanor Lerman delighted us with selections from four decades of a life in poetry and letters. If you couldn't make it out on Saturday, please mark your calendar for Saturday, December 1st, when we'll we back with our twenty-fifth (and final?) issue, featuring David Mills, Joe Okonkwo, Emre Tetik, David Rothman, EXO Books and more. We look forward to seeing you again in December! Until then please check out all the terrific shows and events at Q.E.D. There is something amazing happening there literally every day. We regret that Sarah Riccio is unable to appear today, but we're pleased and grateful to welcome Stephanie Laterza. 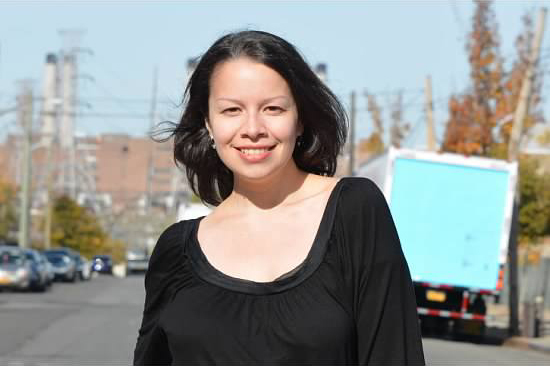 Stephanie Laterza is the recipient of a SU-CASA 2018 artist-in-residence award from the Brooklyn Arts Council, and is the author of the Queens-inspired legal thriller The Boulevard Trial. Stephanie's works of poetry and short fiction have appeared in various publications, including L'Éphémère Review, First Literary Review-East, Ovunque Siamo, Akashic Books, A Gathering of the Tribes, Newtown Literary, The Nottingham Review, and Obra/Artifact. Her poetry chapbook, The Psyche Trials, is forthcoming from Finishing Line Press. 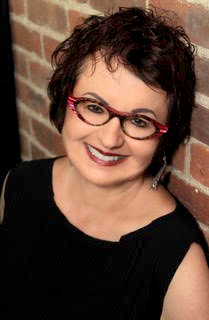 Please join Stephanie and all our outstanding readers for Line Break #24, Sunday, November 4, 3:00 p.m. at Q.E.D. in Astoria. Tickets are only 7 bucks! Reminder: Line Break #24 is this Sunday afternoon! Just a reminder that Line Break, the eclectic monthly live literary magazine, returns this Sunday afternoon in a special Special Sunday Edition in Astoria, Queens. * Sarah Riccio will be unable to appear due to unforeseen circumstances. Sunday, November 4, 2018, 3:00-4:30 p.m.
With those words way back at Line Break #11, the redoubtable Kyle Thiessen introduced us to bickering ghosts Morty and Dolores, victims of a most hilarious zombie apocalypse. By the end of the next twelve minutes we were all ghosts, having died of laughter. Now, for Halloween, we're pleased to announce that "Morty and Dolores" has been published by our friends over at The Piltdown Review. Now you read can read it and die too! Happy Halloween from all of us at Line Break! And big congratulations to Kyle Thiessen. Please read responsibly, and we'll hope to see you at Line Break #24 on Sunday, November 4th. UPDATE: We regret that Sarah will be unable to appear due to unforeseen circumstances. 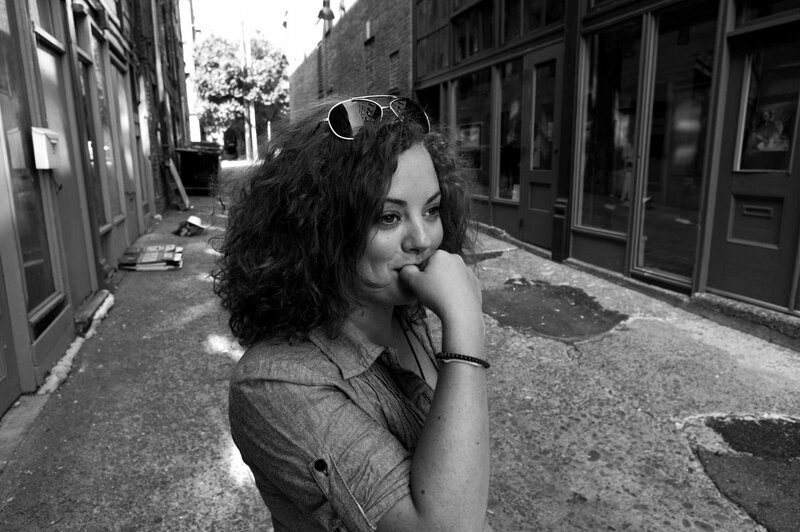 Sarah Riccio studied writing at Brooklyn College. After a storied career slinging beer in Astoria, she now writes for an online sleep resource about bedding and industry news. She never thought she'd get paid to lie on a mattress all day in that capacity . . .
Sarah is a Line Break regular known for her caustic and provocative essays, which she has also performed at Taboo Tales NYC. Her essay "Kids on Division Street," which she debuted at Line Break #1a, will appear next month in The Piltdown Review. 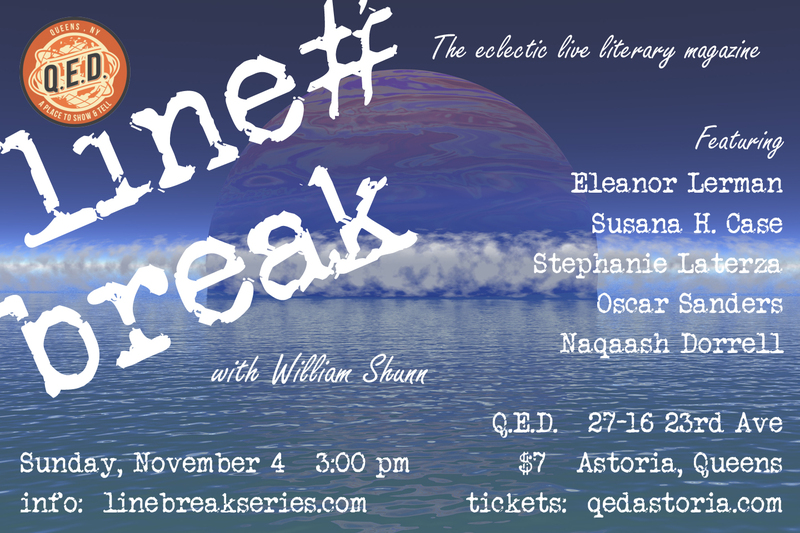 Please join Sarah and all our amazing readers for Line Break #24, Sunday, November 4, 3:00 p.m. at Q.E.D. in Astoria. Tickets are only 7 bucks! Oscar Sanders was born and raised in the Bronx, NY. The former jazz/funk/rock guitarist has garnered awards for shorts, features, documentary films, and a political crime novel, Final Hearing, which won the 2016 NYCHANAACP Just READ Award. 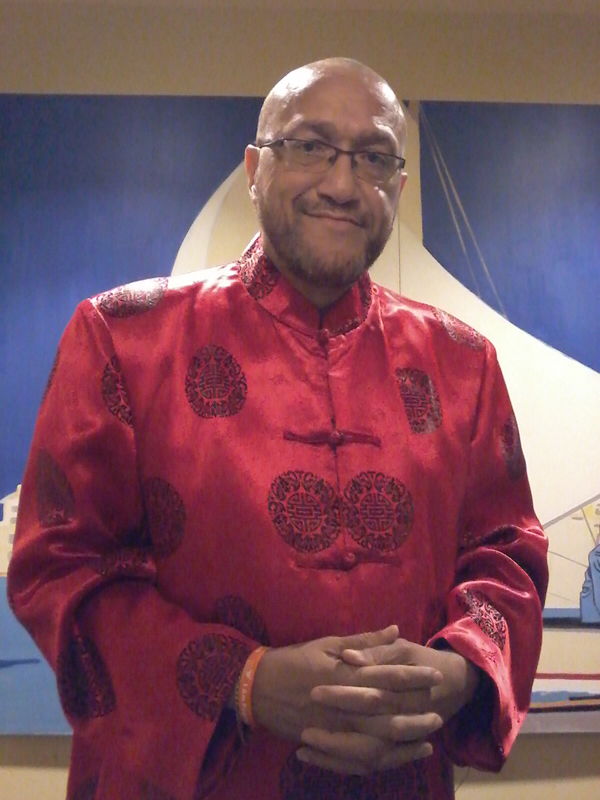 His creative writing led to seething political spoken word poetry and performances, and to his latest award, 2017 Indie Author Legacy Poet of the Year. facebook.com/oscar.sanders.3192, and @oscarsanders. Oscar will be joined by Naqaash Dorrell on percussion. Please join Oscar and all our accomplished readers for Line Break #24, Sunday, November 4, 3:00 p.m. at Q.E.D. in Astoria. Tickets are only 7 bucks! Susana H. Case is the author of six books of poetry, most recently Erasure, Syria, from Recto y Verso Editions, and Drugstore Blue, from Five Oaks Press, as well as four chapbooks. Her first collection, The Scottish Café, from Slapering Hol Press, was re-released in a dual-language English-Polish version, Kawiarnia Szkocka, by Opole University Press in Poland. Recent poems can be found in The Cortland Review, Fourteen Hills, Portland Review, Potomac Review, Rattle, RHINO, and Tar River Poetry, among others. She is a Professor and Program Coordinator at the New York Institute of Technology in New York City. Visit her at susanahcase.com. 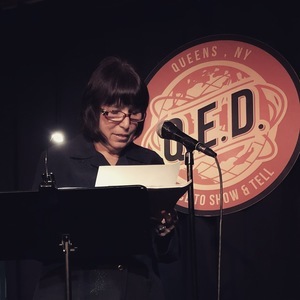 Please join Susana and all our incredible readers for Line Break #24, Sunday, November 4, 3:00 p.m. at Q.E.D. in Astoria. Tickets are only 7 bucks! 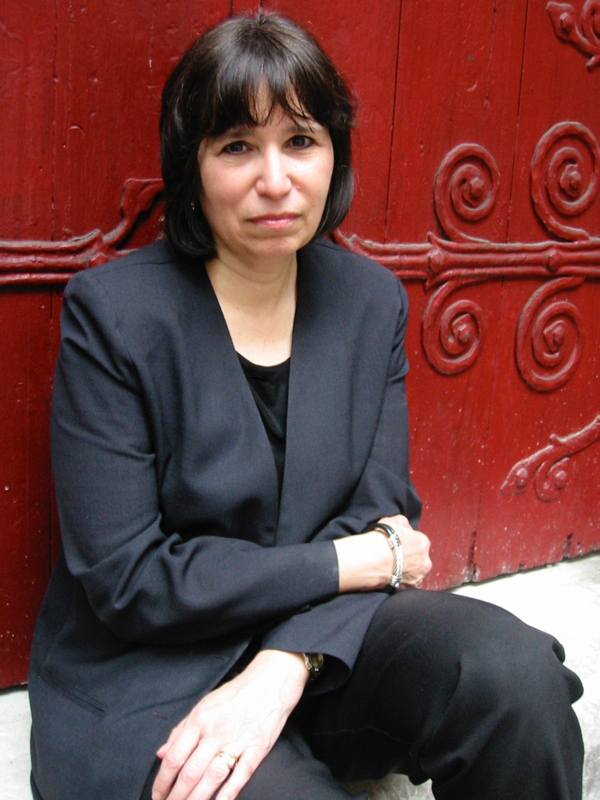 Eleanor Lerman is the author of numerous award-winning collections of poetry and short stories, along with several novels. She is a National Book Award finalist, winner of the 2006 Lenore Marshall Poetry Prize from the Academy of American Poets, and recipient of a Guggenheim Fellowship. Her story collection The Blonde on the Train (Mayapple Press, 2005) was a finalist for the Lambda Literary Award. Her novel Radiomen (The Permanent Press, 2015) was awarded the John W. Campbell Memorial Award for Best Science Fiction Novel. Her most recent novel, The Stargazer's Embassy, was published in July 2017 by Mayapple Press and was a finalist for the Foreword Indies Award. Her new short story, "A Normal Life," appeared in August in The Piltdown Review. Learn more at eleanorlerman.com. 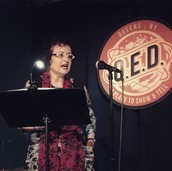 Please join Eleanor and all our outstanding readers for Line Break #24, Sunday, November 4, 3:00 p.m. at Q.E.D. in Astoria. Tickets are only 7 bucks!